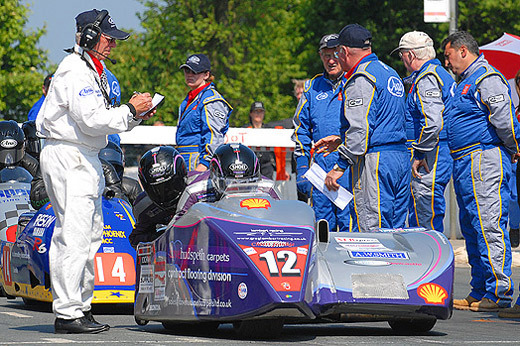 And here is a brief description of how it all began on our recently updated Greg Lambert Formula 1 and Formula 2 Sidecar Racing website. 1988... this was the year it all began, with me and my father Ken Lambert who had always wanted to do sidecar racing. We ventured to Knock Hill circuit in Scotland for our very first outing on our Derek Rumble 650cc BSA sidecar outfit with Dad as driver and me in the chair, both complete novices not knowing what to expect. After 6 laps of practice my Dad said to me if he knew it was this good, you wouldn’t be here today!!! And we had a smile from ear to ear all day long. Just missing out on our first trophy on our first meeting ending third in our first year's championship. Since then I am proud to say after 20 years of dedication by myself, to sidecar racing with full support of my Dad (best friend). We have achieved moto grand prix results, formula one championship winners, formula two road race championship winners, Isle of Man Southern 100 record holders and winners, numerous club championship winners – current, and also podiums at the road racing capital of the world Isle of Man TT – and still striving to achieve my ultimate dream to win the Isle of Man TT races. Over the past 20 years very little of this would have been achieved if it wasn’t for family and friends with their help and dedication. Through good times and bad I have found so many true and loyal friends and followers to whom I am deeply indebted and very grateful. Greg Lambert welcomes you to the Greg lambert Racing website... please do follow Greg's achievements throughout the season.... Sponsors welcome!! !